• As the new federal government considers going into debt to invest in transit, here are a few critical issues to consider. Transit needs to be more affordable with more extensive coverage throughout the Vancouver region. Focusing on only a few transit corridors with very expensive mega-projects drains funding from the base transit needs of the network. However, the public is being held hostage on transit funding until the mega-projects are built. We need affordable electric transit right now to deal with peak-hour demand. The solution is obvious. Building a subway costs approximately $250 to $450 million per kilometre, streetcars $30 to $40 million per kilometre and electric trolley buses only $1 million per kilometre plus $1 million per double articulated electric trolley bus. Therefore, the electric trolley bus network should be used throughout the grid as a priority to disperse gridlock, using streetcar lines and subways only as we can afford them. The City of Vancouver was designed as a transit-oriented city before the common use of the automobile. Within a five to 10-minute walk, each arterial supported our streetcar system, which was replaced by an electric trolley bus system in the 1950s. An expansion of the existing trolley buses now could eliminate diesel while providing more frequent rapid electric trolley bus service throughout the grid and reducing greenhouse gases. Funding models are critical. Transit funding is expected to be split three ways between federal, provincial and civic levels. However, cities should not be required to pay for transit since they do not have the resources to do so. Only seven percent of the tax base goes to cities even though their citizens are primary contributors to the GDP. Using carbon and gas taxes to supplement federal and provincial transit capital funding makes sense. Public Private Partnerships (P3’s) have been required as a precondition for senior government funding. A major drawback is that they privatize public assets in exchange for little or no public benefit, providing the illusion that P3’s are less expensive for the public when this is not the case. P3s keep some debts off the governments books, but the public is paying for them nonetheless. Governments raise capital debt financing at a lower rate than the private sector, so P3’s offer no public cost benefits. Another problematic funding model is what TransLink refers to as the “Hong Kong model” where development is used to fund transit. This means that rather than developers paying the city Community Amenity Contributions (CACs) towards civic amenities to service the increased population (such as community centres, parks, daycare, etc. ), funding from CACs would go instead to pay for transit. But transit is the responsibility of senior governments so this is a form of the downloading of financial responsibilities to cities. It means that large Metrotown-scale tower developments get added as density bonuses in established neighbourhoods unsuited to their community character or plans. We need affordable transit solutions with plans that are democratically supported by the public and compatible with local community planning. A Broadway subway would result in a concrete jungle of density-bonused towers in Grandview, Mount Pleasant, Kitsilano and West Point Grey to feed the growing foreign luxury condo commodities market while most of the region would continue with inadequate transit service. Throughout Vancouver, excessive rezoning is already supporting the kind of land speculation that makes housing less affordable. Large infusions of foreign capital investment disconnect the real estate market from the local economy, pricing local people out of the market. These housing forms that treat housing as a commodity rather than as a community contribute heavily to this. Transit needs to service communities, not subsidize the development industry’s towers. A further concern is the accountability of TransLink. 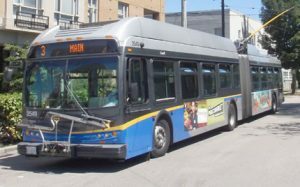 Ever since the province replaced municipal elected officials on the regional board with a provincially appointed board in the early 2000s, there has been controversy over TransLink’s governance. The failure of the transit plebiscite showed that changes are needed. But instead of returning to the regional governance model of elected members, the province has again filled the board with appointments. This is continuing in the wrong direction. As previously reported in the Vancouver Sun, the provincial NDP’s TransLink critic George Heyman has said the new appointments failed to address accountability of the TransLink Board. More elected regional governance is needed to make it effective and accountable. Further, the Sun reported that one of the new appointees, former Police Chief Jim Chu, is in the current employment of a major local development firm. He has been named vice-president of special projects and partnerships for Aquilini Investment Group. Heyman has also raised the issue of conflict of interest: discussions that would happen at the TransLink board about future transit plans will certainly affect land values and development plans. If more federal funding for transit comes to Vancouver, affordable solutions with the broadest network benefits should be the first priority before corridor mega-projects. This can only happen if democratic accountability is restored. Contact your newly elected federal MP to let them know your concerns. Drug expiry dates – are they ever too old? Thanks for your comments, Eric. I heard your interview on Co-op Radio. Well done. I agree with you that there is a lot that can be done to make the bus system more efficient and reduce GHGs. Electrifying the system and adding signal priority and dedicated lanes during peak hours would definitely help. Bus Rapid Transit on more routes throughout the grid would greatly improve the transit system. The advantage of trolley buses over rail is that buses are flexible and can move in and out of traffic depending on needs. During peak hours, more double articulated buses on dedicated lanes can be used, while at off peak, smaller buses and shuttles can reduce empty waste while having more frequent service. This is the low hanging fruit that can easily be implemented. Fully dedicated 24/7 lanes are more difficult, but possible in some locations. I also agreed with your point in the Co-op interview that an extension of the Millennium line from VCC to the Canada Line on Cambie at Broadway makes sense. This ties together the existing systems from a regional perspective. The missing ingredient is bus lanes. Seattle residents just voted for a network of bus lanes, including some full featured Bus Rapid Transit lines. Vancouver is lagging behind most other cities in that we have almost no 24/7 bus lanes. Good transit either requires buckets of money for fully grade separated transit like SkyTrain, or road space for transit lanes. The costs of streetcars are less than LRT, but they still require a lot of roadwork, with underground concrete supports and have to work around utilities. The costs may vary depending on what is involved. On a dedicated right-of-way like the Arbutus line this would be less (excluding the cost of the land). For heavy demand routes electric trolley buses can be double articulated. The advantage of trolley buses is that they are more flexible without having to be restricted to rails so can adjust to demand and route as required. They both have their place as they can be afforded, but trolley buses can have more broad coverage for the same costs, especially since most of Vancouver already has the infrastructure. I agree that LRT has limited benefits, and the cost often is not justified. Streetcars cost about $15 million to $20 million a kilometer to install, while modern light rail costs more because of the reserved of dedicated R-o-W needed to make a tram LRT. The answer is so simple that it almost always overlooked in Metro Vancouver.
! modern tram or streetcar (1 driver) is as efficient as six buses (6 bus drivers) and for every bus or tram operated one needs a minimum of 3 people to manage, maintain and operate them. On heavily used transit routes when traffic flows exceed about 2,000 pphpd, trams become cheaper to operate; the heavier the traffic flows the more efficient trams become. Over a 40 year period, the average lifespan of a tram, at least 3 bus replacements must be made and in the end, a transit route using trams not only pays its operating costs, it pays it capital costs as well. Added benefits of tram operation is that traffic flows in excess of 20,000 pphpd can be accommodated; trams have proven to attract much new ridership, unlike buses, operating costs are about one half of buses. The modern tram or LRT has also made mini or light metro systems like SkyTrain obsolete, as they can carry far more people at a cheaper cost. The underlying problem with TransLink and the failed plebiscite is that Translink’s desire to build with SkyTrain, means it is spending far more money than it should on selected transit lines. This has lead TransLink having a a cost per revenue passenger one third higher than Edmonton, Calgary and Toronto. TransLink does not have a revenue problem, it has a spending problem and the regional politicians are to ignorant to understand this.